This is a very good day for me! For the first time, one of my videos made it into the HoustonPress online! It was filmed at Erie City Iron Works, Dakota Lofts Gallery, Beinville Furniture Co., The Docks, and Atomic Cafe. I produced the interviews and shot all of the footage for this video of Artcrawl 2008 that you're about to see. My friend Bill and I both edited the 40 minutes of video I compiled down to 9:12 minutes. It has everything from PILGRIMS who came out to enjoy the art, to graffiti and abstract pro-artists!!! Here's a link: http://blogs.houstonpress.com/hairballs/2008/11/artcrawl_houston_2008_now_with.php. Leave a comment! If you ever need anything for your event to post online, let me know! I have more of my videos online at youtube.com/zapn2rachel. Enjoy! UPDATED 11/18/08: DJ Riddler of the world famous Booth Pimps and Dave Morales have aired their final LIVE broadcast from Roxy in Houston, TX. for CBS Radio. Their last hit was Friday, November 14, 2008. They played for a few months on Friday nights from 10p-2am. ROXY never has regained the garnered rep it had when it opened more than a decade ago. In my opinion, it never will. Nonetheless, DJ Riddler looked beyond the dancefloor to introduce the latest House music until the last intangible minute of airtime he had on 95.7. I know because I was there. He used his rare opportunity on Friday nights to introduce the latest house tracks he consistently brought straight from New York and across the world to Houston masses. He also shared his own remixes of today's pop queens. 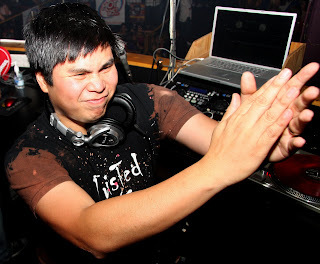 However, and only in Houston, would DJ Riddler's lifetime career in music and cultured New York talent be compromised. The compromise: being forced to play the tired, filthy rap tracks that would challenge any progress he tried to make. Yet, on recent Friday nights, ROXY would get busy by the time talent hit the airwaves, with regulars and old friends stopping in to say "hello" in support of their pursuit. So many locals aren't willing to put their reputations on the line like these two have in recent months, so I have to commend DJ Riddler for doing what he did to attempt to take that next step on Houston airwaves. Now, as this latest exertion to introduce new music to Houston has come to a close, THE MISSION CONTINUES. Each are on to new adventures. At this time, I simply "advise..." keep a close eye on DJ Riddler and Dave Morales as these two move into their bold futures. They will BE BACK SOON! I shot and edited a mix of The Riddler and Dave Morales at the Roxy. Listen to my version of The Riddler and Dave Morales in action!